Mrs. Vidya MN has completed her Masters of Law [LL.M] in 2004 specializing in Constitutional Law [secured 5th rank] and Bachelor of Law [LL.B] in 2002 from University Law College, Bengaluru. 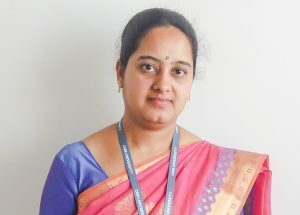 She has also pursued PG diplomas in Human Rights & IPR from NLSIU, Bengaluru and Cyber law from NALSAR, Hyderabad and has completed M.B.A [specializing in HR] from Annamalai University and M.A in History from Kuvempu University. In her 11 years teaching experience she has taught students of law, management, engineering and CA. She has presented/published several papers and delivered a guest lectures on topics like “Right to Education â€“ With special reference to Indian Constitution”. She has also been a part of various National and State seminars, conferences, and workshops.